Most women know that hormonal contraception comes with many potential side effects, not just short-term but also long-term. But what most women don’t know is that there is a hormone-free alternative readily available. It is called Lady-Comp, a fertility monitor that tracks your cycles and tells you exactly on which days you are fertile and could potentially become pregnant. 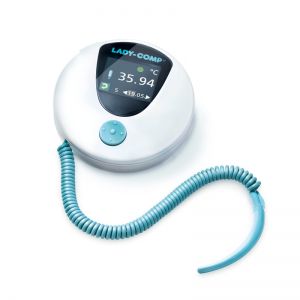 Lady-Comp tracks your monthly cycles by measuring your Basal Body Temperature. Based on that, it will tell you exactly on which days you are fertile and on which days you are not. Each morning when you wake up and measure your temperature, it will give you either a green, orange or red light. Green means you are not fertile on that day, red means you are fertile and orange means it is uncertain so it is up to you whether you want to take the risk or not. It is important that you take your temperature around the same time each morning, so Lady-Comp has a built in alarm clock to wake you up. You can take your temperature up to 3 hours before or after your previous temperature reading time. So that means that if you took your temperature reading at 7am the previous day, the next day you could take your temperature anywhere from 4am to 10am. You also need to have slept for 5 consecutive hours before taking your temperature. Upon waking, try to move as little as possible before you take your temperature, as this will provide the most accuracy. If you end up having to get up before taking the temperature and you have had 5 hours of sleep that night, you need to lie in bed for at least another hour before you can take your temperature. This may seem like a bit of a hassle but if you have a regular routine it shouldn’t be a problem. Also, Lady-Comp was built to be able to handle days without any temperature readings, so as long as it doesn’t become a habit, you should be fine if you miss a day. Additionally, on the days that you are menstruating, you simply enter the ‘M’ symbol. Also, if your temperature is over 37.8 degrees Celsius, an ‘F’ symbol will appear which indicates that you are having a fever. Lady-Comp will also predict the day when you are ovulating by flashing the red light. Therefore, Lady-Comp could also be used to predict your most fertile days to increase your chances of pregnancy, instead of using it as a contraceptive. All in all, it is fairly straightforward and, if used correctly, a very reliable natural alternative to hormonal contraception. My experience with it has been very positive and I would highly recommend it to other women who are tired of all the side effects and potential dangers of hormonal contraception. Please note I am not in any way sponsored by or affiliated with Lady-Comp and its manufacturers.